Good Thursday Morning! I hope this is finding you all well! We are in the middle of another one of our Lake Effect storms that will span a few days, so the snow is piling up that's for sure. They claim by Sunday once it's over we will be right around the 3 foot mark..YUK! So, hopefully, you are warm and snug where ever you happen to be. 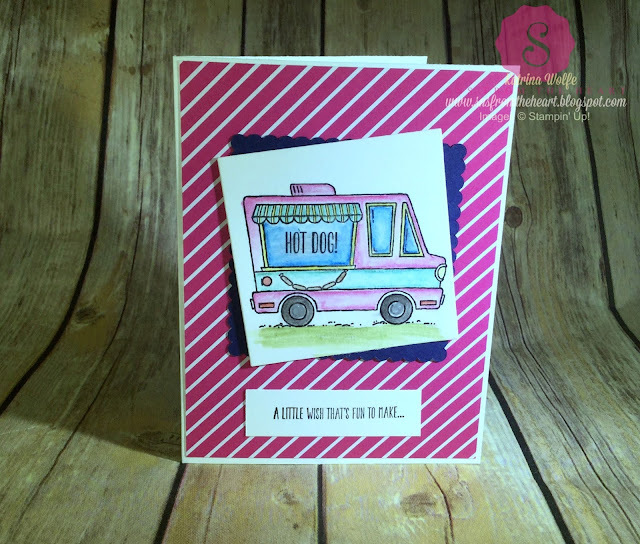 Anyway, I have a cute card I wanted to share with you today, and it's using the Sale-a-bration set, Tasty Trucks. I just love this set and think it's absolutely adorable. I used the Blender Pens to distribute and blend out the watercolor pencil and it worked beautifully. I think it has become my favorite way to use these pencils, it's just so smooth especially on the Shimmery White paper. Begin by adhering the DSP to the card base. then run the Night of Navy through the Big Shot with the largest Scalloped Square and adhere that to the upper center of the card. 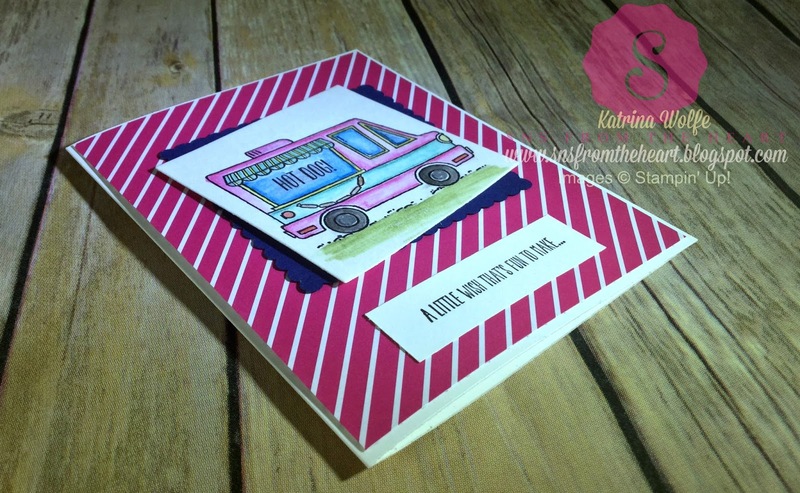 Then stamp the image onto the Shimmery White cardstock and I added the Hot Dog and string of hot dogs as well. Then, using the watercolor pencils I layed down an outline of color and pulled the color into the image using the Blender Pens. I then ran that through the Big Shot with the second to the largest straight edged Square framelit and popped it up on to the card using Dimensionals. I then stamped the sentiment using the Basic Black ink onto a scrap of Whisper White and adhered it to the bottom front of the card using Fast Fuse. Another quick and easy card that was fun to make. I hope you enjoyed today's card share. Please leave me a comment and let me know what you think. I look forward to hearing from you and I wish you all a wonderful day!